With its perch right on the chilly Pacific Ocean, San Francisco has quite the foggy reputation and several foggy days have been immortalized in postcards and print. But I'll bet you've never seen the fog quite like this. Photographer Simon Christen just released his video "Adrift," culminating a two year project that he says "is a love letter to the fog of the San Francisco Bay Area." His project aimed to "capture the magical interaction between the soft mist, the ridges of the California coast and the iconic Golden Gate Bridge. In the meantime, he got quite a lesson on Bay Area meteorology. "The weather conditions have to be just right for the fog to glide over the hills and under the bridge," Christen wrote on his Vimeo page "I developed a system for trying to guess when to make the drive out to shoot, which involved checking the weather forecast, satellite images and webcams multiple times a day." If the weather looked promising, he'd make the 45-minute drive to the Marin Headlands. While many trips ended up fruitless because the fog bank was too high, too low, or already gone, "once in a while the conditions would be perfect and I was able to capture something really special." Why is San Francisco so foggy? The loud drone of fog horns is a near daily occurrence around San Francisco, thanks to their proximity to the chilly waters of the Pacific Ocean, which varies between 52 degrees in the late winter to around 60 in the late summer. That's due to a process called "upwelling", which occurs when winds along the surface blow ocean water away from the coastline. That process pulls up deeper water to the surface to replace the "missing" water that's being blown away. That deep water is much colder since it doesn't get the surface warming from the sunshine, and thus the surface temperature of the ocean where upwelling is occurring is much cooler. In our case, It's helped by the easterly trade winds out in the central Pacific Ocean that help pull the water away from the West Coast -- sort of like when you roll over and pull the blanket off your spouse. Here is a recent chart of sea surface temperatures off the California coast -- notice how chilly it is along the coast. When you get warmer air moving in off the Pacific and it hits those cooler waters along the shorelines, the air near the surface will cool and condense into a thick fog. Then as the ground in the inland Bay Area heats up each day, the hot air rises, creating lower pressure near the surface. The fog just offshore is then drawn inland to replace that rising air -- a "marine push". A similar effect occurs here in the Seattle area, only the fog has a lot farther to travel, so it takes a moderate to strong push to bring the marine clouds into Seattle, while even a very light push will bring fog in through the San Francisco Bay, allowing for those dramatic shots Christen found. Marine GeoGarage now supports SSL for its B2B API web service - at no extra charge. SLL is a necessity for every secure website, and it's vital to have all remote resources sent via the HTTPS protocol in order to protect users' privacy and to avoid mixed-content warnings. Our Content Delivery Network (CDN) domain is now using a certified SSL. We've made it incredibly easy to start using SSL. So our customers can access the full REST API securely for fetching raster tiles. 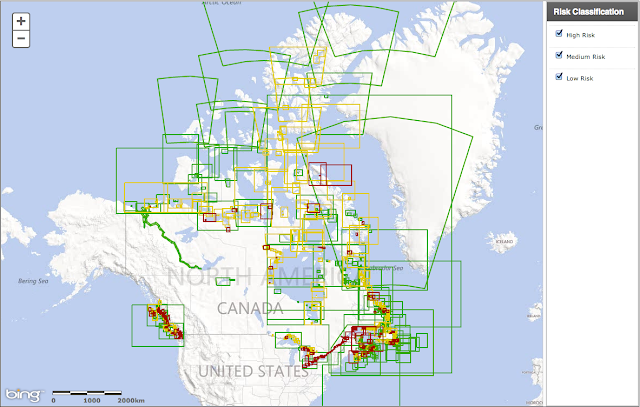 Our API will automatically detect when the user of our GeoGarage nautical chart layers which are embedded in a third-party webmapping (for example for Vessel Tracking applications) is using a secure webpage and will use purely SSL resources when necessary. These requests have no additional cost; HTTP and HTTPS traffic is billed at the same rate. A relative risk classification for areas delineated by Canadian Hydrographic Service chart limits. A classification is used to determine a Level of Service for charts and other CHS products and services. The risk levels are defined as High, Medium and Low with the High-risk areas receiving more of our resources and more frequent updates. Many factors are considered in the risk assessments such as the number of accidents in a given area, tanker routes, traffic, infrastructure, navigational complexity, and more. For more information, please visit the Levels of Service section of the Canadian Hydrographic Services web site. High-risk charts (paper, ENC, raster) are reviewed at least once every five years and new editions are issued when necessary. BSB updates (file replacement) are issued monthly. Medium-risk charts are reviewed at least once every ten years and new editions are issued when necessary. Low-risk charts are generally updated through "Notices to Mariners" only. The release of new editions (ENCs and paper charts) is within three months of each other. Charts and Publications are always available. The four Catalogues of Nautical Charts and Publications are updated and published every two years. Researchers from Deakin University and Parks Victoria have been surveying the Wilsons Promontory seabed using multi-beamed sonar mapping technology. Until now, the landscape under the waves at Wilsons Promontory has been a mystery. But the sea floor's secrets have been uncovered by researchers from Deakin University and Parks Victoria. Marine ecologists and engineers spent six weeks surveying the seabed using multi-beamed sonar mapping technology. They found unexpected features such as a 30-metre-high underwater sand dune and holes in rock up to 90 metres deep. 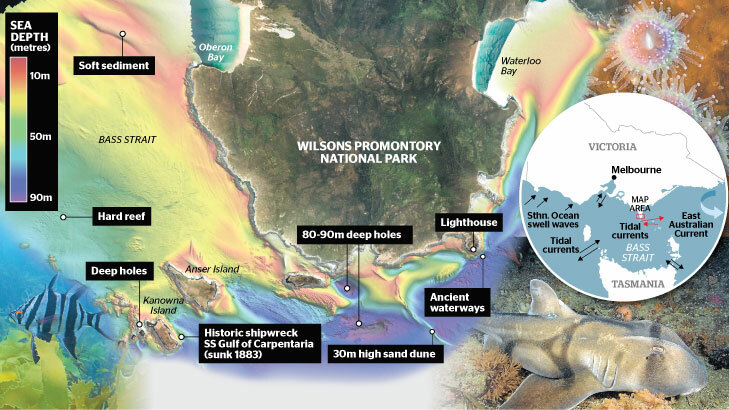 Ancient waterways dating back 20,000 years, when the area was above water and linked the mainland to Tasmania, have also been found 60 to 70 metres below the surface. Deakin University marine scientist Daniel Ierodiaconou said the findings were unexpected. ''The amount of structure and variation in the detail surprised us all,'' he said. Parks Victoria marine science manager Steffan Howe said he was interested to learn that not all of the sea floor was composed of sand. ''It looks like we have large areas of reef, which is potentially important because with a hard bottom we have the potential for more plants and animals,'' he said. Among the creatures to call the area home are the Australian fur seal, the southern sand octopus, red velvet fish and orange sponge. The maps generated from the sea floor survey will inform the management of the 15,580 hectare site, Victoria's largest marine national park. ''This information is filling a really important gap,'' Dr Howe said. For example, marine ecologists know that the northern Pacific seastar - one of Australia's biggest marine pests, which was found in Tidal River last year - prefers to live in a sandy environment. The survey allows targeted monitoring of sandy habitat. An introduction to marine habitat mapping in Victorian Marine protected areas. Shaped by strong currents from the north and west, the seascape supports a diverse range of species, including fish, seaweed and small invertebrates. 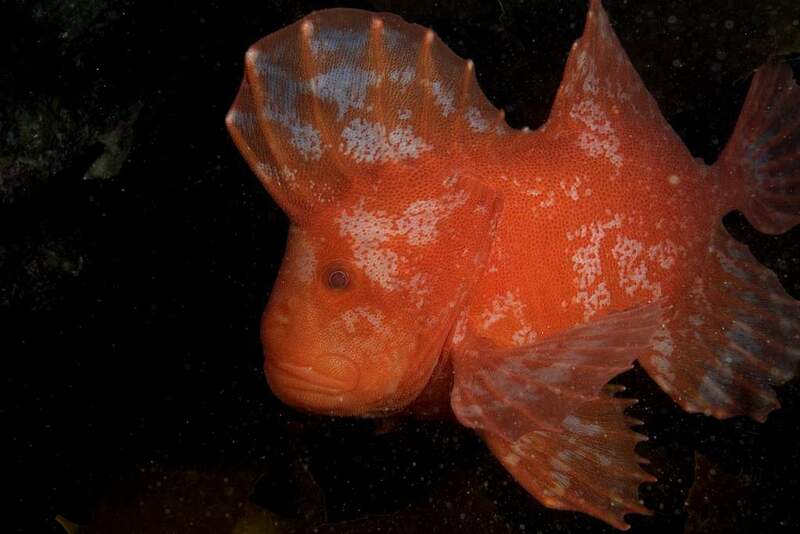 For more than 120 of them, the marine park is the furthest part of their distribution range. 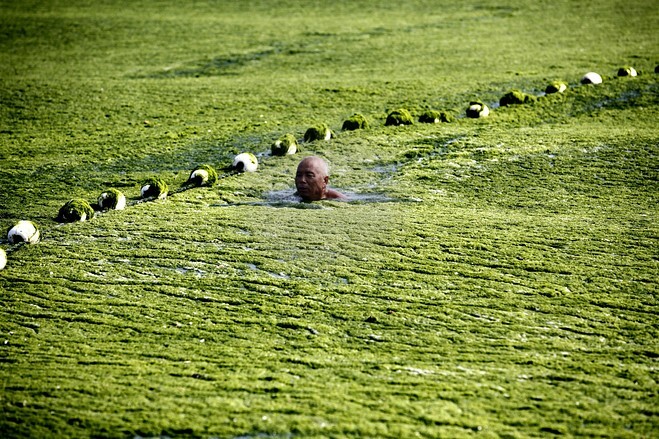 Algae overwhelms a popular beach in Qingdao, east China. Officials use bulldozers to remove it. The algae boom may have been caused by pollution from industry. The region has had algae booms six years in a row, but this year's is twice as big as the previous largest in 2008. The algae is not dangerous to humans but can suffocate marine life by sucking oxygen from the water. The seas off China have been hit by their largest ever growth of algae, ocean officials said, with vast waves of green growth washing onto the shores of the Yellow Sea. Pictures showed beachgoers swimming and playing in the green tide in the eastern city of Qingdao, while bulldozers shoveled up tons of algae from the sand. The State Oceanic Administration said on its website that the algae, enteromorpha prolifera, started to appear a week ago and had spread across an area of 28,900 square kilometers (7,500 square miles). 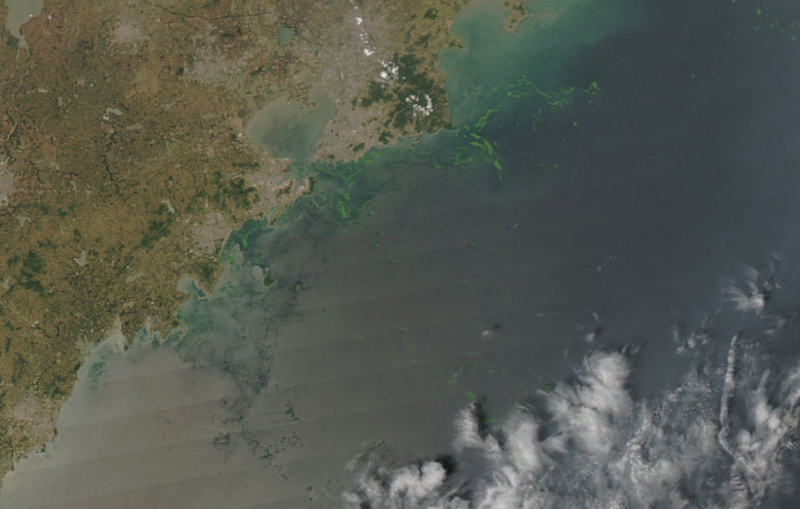 Algae in the Yellow Sea near Qingdao in 2008. The previous largest bloom was in 2008 when it affected around 13,000 square kilometers, it said. Qingdao officials said they had removed around 7,335 tons of algae, the official Xinhua news agency reported. 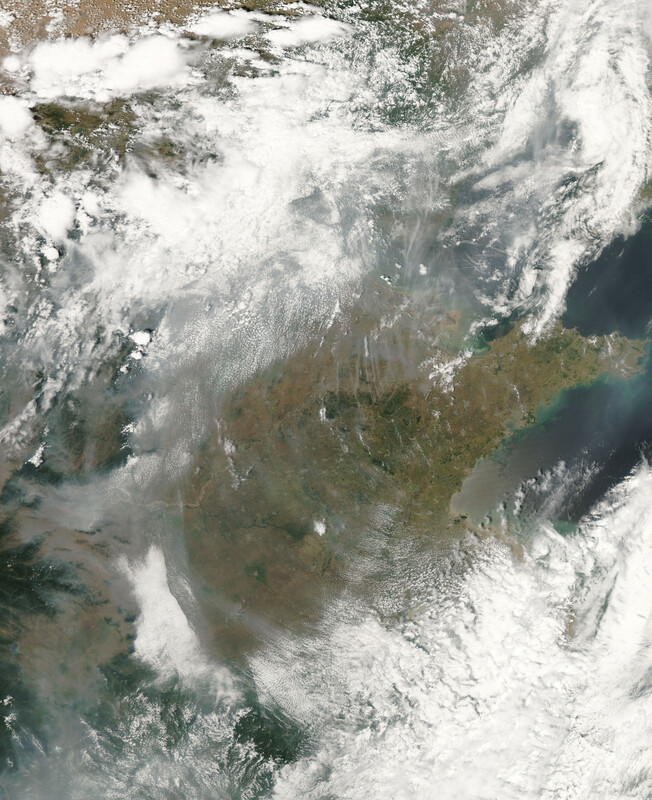 The algal phenomenon is usually caused by an abundance of nutrients in the water, especially phosphorus, although the triggers for the enormous blooms that began to appear in the Yellow Sea in 2007 remain uncertain. The algae are not toxic nor detrimental to water quality, but lead to extreme imbalances in marine ecosystems by consuming large quantities of oxygen and creating hydrogen sulphide. Cleaning algae off a fence near the coastline. After a week's cleaning efforts, the biggest algae outbreak since 2008 in the coastal waters near Qingdao, Shandong province, is under control, with tourists and locals swarming to the beach once more. Experts estimate that the algae will thoroughly vanish before August as the temperature rises. Han Peijin, director of the No 6 sea bathing beach of Qingdao, is used to dealing with the algae every summer, and he is optimistic about the situation. "More than 10,000 people came here on Sunday, and you could barely see the algae today," he told China Daily on Monday. "The algae blooms last less than a month, and it's under control now." Local authorities have launched a special team to monitor and clean up the algae. 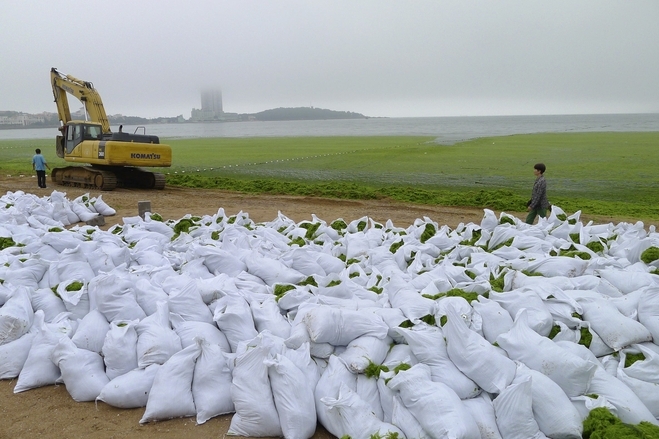 Since June 8, 24,400 meters of netting has been laid in waters around the coasts of major tourist attractions, 230 fishing boats have collected 22,000 metric tons of algae, and 51,072 tons of algae brought ashore by waves has been removed by bulldozers. A large number of university students also volunteered to clean up the beach. Liu Tao, an algae expert at the Ocean University of China, said the algae - or enteromorpha prolifera - will not survive when the water temperature goes above 23 C.
Thus far, the water temperature is 19 C, "therefore although it looks well today, we still have to keep alert," he said. "Besides, a large amount of precipitation will also kill the algae. A lack of rain is part of the reason for this year's outbreak." Pang Shaojun, another ocean university researcher, said pollution and eutrophication are the primary cause of algae blooms, and the algae appearing in Qingdao has mainly drifted from South China. Pang also said that how to deal with algae outbreaks has become a hot research point for scientists around the world. The company uses algae in three ways, namely feed additives, organic fertilizers and materials for healthcare products, said Shan Junwei, president of the company. "Since 2008 we have developed quality algae fertilizers for fruit trees, vegetables, organic agriculture and urban gardening," he said. "Hundreds of tons of bio-fertilizers made of algae have been sold to more than 20 provinces and regions." The company is researching a method to extract polysaccharide from the algae for nutritional products. A primeval underwater ocean has been unearthed just a few miles off the coast of Alabama. Here, a sonar map reveals its extent. The stumps of the Cypress trees span an area of at least 0.5 square miles (1.3 square kilometers), several miles from the coast of Mobile, Ala., and sit about 60 feet (18 meters) below the surface of the Gulf of Mexico. Raines was talking with a friend who owned a dive shop about a year after Hurricane Katrina. The dive shop owner confided that a local fisherman had found a site teeming with fish and wildlife and suspected that something big was hidden below. The diver went down to explore and found a forest of trees, then told Raines about his stunning find. But because scuba divers often take artifacts from shipwrecks and other sites, the dive shop owner refused to disclose the location for many years, Raines said. In 2012, the owner finally revealed the site's location after swearing Raines to secrecy. Raines then did his own dive and discovered a primeval Cypress swamp in pristine condition. The forest had become an artificial reef, attracting fish, crustaceans, sea anemones and other underwater life burrowing between the roots of dislodged stumps. Some of the trees were truly massive, and many logs had fallen over before being covered by ocean sediment. Raines swam the length of the logs. "Swimming around amidst these stumps and logs, you just feel like you're in this fairy world," Raines told LiveScience's OurAmazingPlanet. Raines reached out to several scientists to learn more about the forest. One of those scientists was Grant Harley, a dendrochronologist (someone who studies tree rings) at the University of Southern Mississippi. Harley was intrigued, and together with geographer Kristine DeLong of Louisiana State University, set out to discover the site's secrets. The research team created a sonar map of the area and analyzed two samples Raines took from trees. DeLong is planning her own dive at the site later this year. Because of the forest depth, scuba divers can only stay below for about 40 minutes before coming up. Carbon isotopes (atoms of the same element that have different molecular weights) revealed that the trees were about 52,000 years old. The trees' growth rings could reveal secrets about the climate of the Gulf of Mexico thousands of years ago, during a period known as the Wisconsin Glacial period, when sea levels were much lower than they are today. In addition, because Bald Cypress trees can live a thousand years, and there are so many of them, the trees could contain thousands of years of climate history for the region, Harley said. "These stumps are so big, they're upwards of two meters in diameter — the size of trucks," Harley told OurAmazingPlanet. "They probably contain thousands of growth rings." The team, which has not yet published their results in a peer-reviewed journal, is currently applying for grants to explore the site more thoroughly. Harley estimates they have just two years. "The longer this wood sits on the bottom of the ocean, the more marine organisms burrow into the wood, which can create hurdles when we are trying to get radiocarbon dates," Harley said. "It can really make the sample undatable, unusable." All passenger ships and merchant vessels above gross 300t must now carry and use the Automatic Identification System (AIS). It is a powerful tool. AIS broadcasts not just position, course, and speed, but also information about a ship's type, draught, cargo - even its captain. Originally intended as a near-shore safety system, new satellite-borne receivers capable of picking up the signals mean AIS now operates across the globe. But AIS has its limitations. In the densest traffic lanes, it can be difficult from orbit to distinguish individual ships, and this will be even more challenging if all vessels are mandated to carry the system. Also, in an ideal world, AIS needs to be used alongside other technologies. Criminals will be tempted, for example, to disable their ship's AIS and conduct their activities in weather that impedes air reconnaissance. But if an AIS receiver is mounted on a satellite that also has radar, it will be possible to detect this ship through cloudy skies, day or night. The ship's owners will then have to explain why their AIS is not switched on. All vessels using international waters should be identifiable and be part of a global tracking system to close a "security loophole" on the high seas. The call was made by the Global Ocean Commission, an "independent high-level initiative on the future of the ocean". The commission said current technology made the idea feasible and affordable. At present, only passenger and large merchant vessels are legally required to have unique ID numbers and tracking devices. Previous studies have highlighted a link between the lack of unique identification and tracking technology and criminal activity, such as people trafficking, illegal fishing and terrorism. Officials investigating the 2008 Mumbai attacks in India, which left more than 160 people dead and injured hundreds more, said the attackers used a private fishing trawler to reach the Indian city after they overpowered the vessels' crew. "In the 21st Century, when governments are doing so much to make their borders and citizens secure, it seems extraordinary that they have left a loophole big enough to sail a trawler full of explosives through," commented Jose Maria Figueres, one of the commissioners and former Costa Rican President. "There are details to be worked though, such as the cost of tracking systems, although from the evidence we have heard so far we do not think that will be an obstacle." He added: "For the security of citizens around the world, it seems clear that it is time to close the loophole." Vessels can use a number of electronic systems for identification and communication, one of which is known as the Automatic Identification System (AIS). AIS is a short-range system, using VHF radio. However, satellites in low-Earth orbit can also detect AIS signals, which provides real-time global coverage. The commissioners said that many governments were taking steps to address the issue in their own waters but - they added - there had been very little progress to tackle the problem in waters outside of national jurisdiction. Another commissioner and former UK Foreign Secretary David Miliband observed that legally requiring ID and real-time tracking of vessels using the high seas would also deliver other benefits, such as cracking down on human trafficking and illegal fishing opportunities. "Mandatory vessel ID and tracking would reward those who play by the rules and penalise those who do not," Mr Miliband said. "It would create economic opportunities for the 'good guys' and improve the social conditions of seafarers." Writing in the journal Science in 2010, a study suggested that up to 26m tonnes of fish, worth an estimated $23bn (£16bn), were landed illegally each year. The commission issued its recommendations for vessel monitoring at the end of a two-day meeting in New York and is expected to publish its final report in mid-2014. 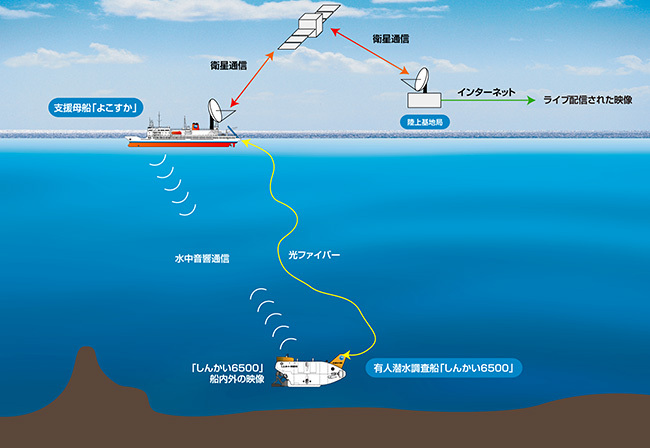 The deep submergence vehicle SHINKAI 6500 was scheduled to dive 5,000-meter deep in the ocean for a purely scientific research purpose. The scientific exploration was fully broadcast live on the Internet. Five kilometres, or 3.1 miles, is not a great distance on land – the length of a pleasant stroll. But five kilometres vertically in the ocean separates different worlds. On 21 June I had the opportunity to make that short journey to another world, by joining Japanese colleagues for the first manned mission to the deepest known hydrothermal vents, five thousand metres down on the ocean floor. The goal of the expedition, led by Prof Ken Takai of the Japan Agency for Marine-Earth Science and Technology, was to study the limits of life at deep-sea vents in the Cayman Trough as part of a round-the-world voyage of discovery by the research ship RV Yokosuka. In February, I had led a British expedition investigating the same vents with a remotely operated vehicle, so I was delighted to join the team actually visiting them inside one of the few machines that can carry people beyond five kilometres deep. Crammed into the two-metre chamber of the Shinkai6500 with pilot Yoshitaka Sasaki and co-pilot Yudai Tayama, we waited for the team on the deck of the RV Yokosuka to hook us up to the stern gantry and lift us out over the rolling blue waters of the Caribbean. We fanned ourselves as the temperature inside our hollow metal ball rose past 30C in the tropical morning sun. At 09.07 we were lowered gently into the water, detached from the ship, and sank beneath the grip of the waves on our journey into the void below. Five minutes after leaving the surface, we passed 200 metres depth and entered the "twilight zone", where sunlight is already too dim for microscopic algae to thrive. Our portholes became discs of the deepest blue imaginable – a colour eloquently described as "luminous black" by deep-sea pioneer William Beebe, after whom we named the undersea vents below. Beebe and his colleague Otis Barton were the first people to venture into the deep ocean and see its life first-hand, when they dived in their bathysphere in the early 1930s. At 09.29 we passed 923 metres deep – the maximum depth reached by Beebe and Barton in 1934. Moments later we entered the "midnight zone" beyond 1,000 metres deep, where not even the faintest traces of sunlight remain. With our sub spinning slowly during descent, and an outside water temperature of 5.3C now thankfully cooling us, we were passing through one of the least-known realms of our planet: the huge interior volume of the ocean. The name of this voyage, “QUELLE”, is an acronym for “Quest for the Limit of Life”. This is a water world without walls, inhabited by creatures of ethereal beauty. From the vantage point of my 10-centimetre porthole, I glimpsed life forms with outlines like blown glass occasionally drifting past our lights, while small crustaceans hovered around like flies, keeping pace with our descent. All are part of the ecology that transfers carbon from surface waters to the depths below, via the perpetual rain of particles processed by those that live here. At 09.56 we reached 2,200 metres depth – a personal milestone, as that was the deepest I had been before, but this time not even halfway to the bottom. Forty minutes later we passed the average depth of the oceans, at around 3,800 metres. Finally, after free-falling through the water for two hours, we approached the seafloor at a depth of 5,099 metres, stirring up a temporary cloud of silt as we touched down. As the silt cleared, we found ourselves on a flat plain of yellow-tinged mud, inscribed with pits, burrows and tracks by species that eke out their existence on the detritus that settles from above. To reach the Beebe Vent Field some 400 metres away, we crept across a landscape of alien contours, shaped by processes different from those that sculpt the land. The deepest known vent, at nearly 5 kilometers (3 miles) beneath the ocean surface. Within a few minutes, the pool of light in front of our submersible revealed a slope of grey lava rubble, which eventually gave way to jumbled blocks of rust-coloured sulfides – the minerals formed by the deep-sea vents. Soon afterwards, we arrived at our target site: a set of "black-smoker chimneys" at a depth of 4,967 metres. These slender mineral spires, two storeys high, are pipes from which fluids hotter than 400C gush into the ocean. The hot fluids are quenched by the chilly waters of the deep sea, and form a billowing plume of smoke-like particles that we can detect nearly a kilometre above. Sitting next to this force of nature in the Shinkai6500, surrounded by vast darkness and a pressure greater than half a tonne per square centimetre, was simultaneously humbling and wonderful. Anemones and blind shrimp found near the vents. Through dexterous operation of the Shinkai6500's mechanical arms by pilot Sasaki-san, we quickly began collecting samples of rocks, the hot fluids from the vents, and the creatures thriving around them: speckled anemones with almost-translucent tentacles, and the orange-tinted shrimp scurrying among them. 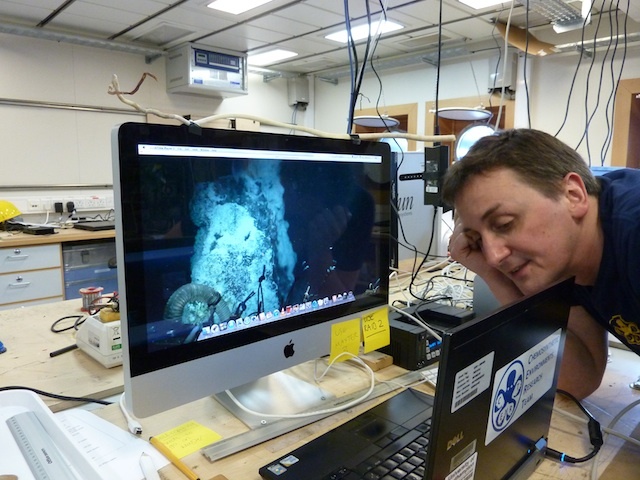 At five kilometres deep, our time on the seafloor was limited to three-and-a-half hours, which we burned through attempting to complete our scientific "to do" list. All too soon, the visit to the vents was over, and we began our return to the world above. But the deep ocean had one more gift to give. With the lights switched off during ascent, I could press my face against the porthole to see the bioluminescent displays of deep-sea animals: flashes and squirts of light in the smothering darkness, triggered by the passing of our submersible. This spectacle is usually invisible to the cameras of remotely operated vehicles, which lack the sensitivity of a dark-adapted human eye. At a depth of 426 metres, I could also see faint light reflecting from a white plastic tray at the front of the submersible – the first detectable photons from the sunlit world above, heralding our imminent return. Thanks to the thick walls of the submersible's sphere, we had no need to decompress during our ascent, because we had remained at surface pressure throughout the dive. By 17.32 the Shinkai6500 was secure again on the deck of RV Yokosuka, where our colleagues were waiting to rush our payload to the ship's laboratories. We hope those samples will help in projects to understand the limits of life in the ocean, and reveal more about how our planet works. Our previous visits to these vents with remotely operated vehicles have already yielded a menagerie of new deep-sea species. For those of us inside the sub, the opening of the hatch signaled a welcome chance to uncurl our limbs after eight hours, feel the touch of sunshine on our skin again, and answer nature's call. The deepest point that we reached on the dive was 5,114 metres, when we travelled across the seafloor from our landing site to the vents. Although few people have reached depths of five kilometres, that is still less than halfway to the deepest spot, the 11-kilometre Challenger Deep of the Marianas Trench. But last year, Hollywood director and ocean explorer James Cameron visited that furthest point, more than fifty years after Jacques Piccard and Don Walsh first reached it. After millennia of crossing the oceans in ignorance of what lies beneath, there is no longer any part of the abyss beyond our reach if we can find the will to go there. And the deep ocean is no longer out of sight or out of mind: the day after our first dive, Prof Ken Takai broadcast live from the Shinkai6500 at the vents to an online audience of more than three hundred thousand people, who made more than half a million comments during the event. 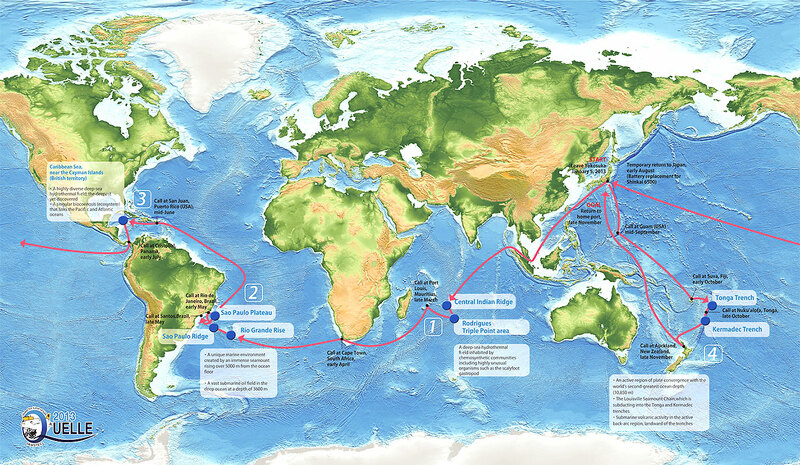 The motives that spur our further journeys into the deep ocean will define its future. We can go there to learn from it, or to exploit its natural resources for our rapidly expanding population. Or perhaps for once we might achieve a balance between the two. The challenge of the deep ocean is no longer technological; now it is a test of whether our wisdom can match our ingenuity. This is a promotional film showing the fantastic 1929 Classic yacht HALCYON. She is operating as a charter yacht around the UK and gives the opportunity to taste the luxury lifestyle.